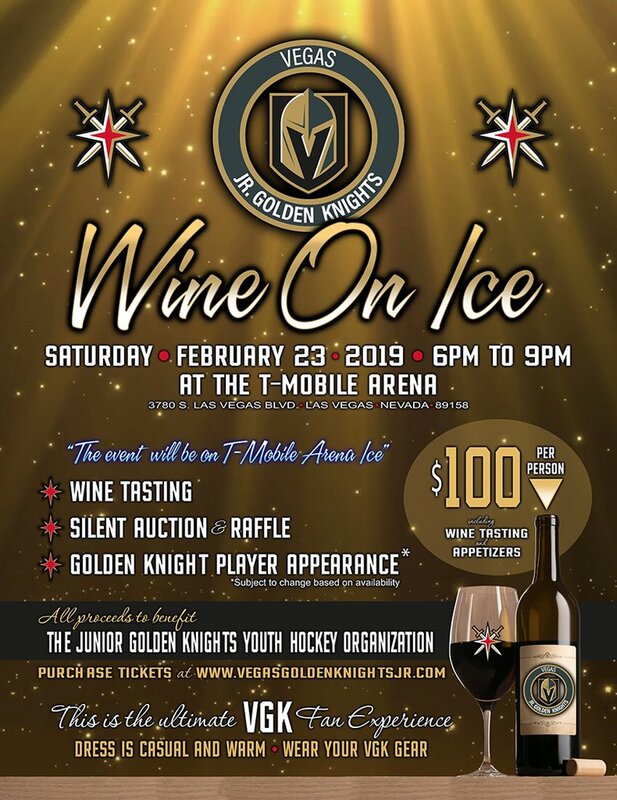 The 2nd annual “Wine on Ice” event to support the Jr. Golden Knights is literally headed on the ice. While last year’s event took place in the lobby of City National Arena, this year attendees will gather on the ice at T-Mobile Arena. The event is Saturday, February 23rd from 6-9 PM. It’s $100 per person and all of the proceeds benefit the Jr. Golden Knights. Last year, the Jr. Golden Knights provided more than 20 scholarships to players in financial need. The JrVGK are also sending 3 teams to National championship tournaments. The Bantam AA, Midget AA, and high school teams will go to Nationals in April, and two teams are headed to international tournaments. The Squirts AA are attending the Squirt international tournament in Fargo and the nationally ranked (#11 in the country) Pee Wee AA are competing in the Pee Wee international tournament in Quebec. The money raised from the “Wine on Ice” event helps to fund all of these great endeavors and continues to build the game of hockey in Las Vegas. Aside from wine and appetizers, the event promises to be a unique experience mirroring some of the excitement of the game experience with music and emcee Nick Grismondi all while allowing the fans to be “on” the ice. Last year’s event was an absolute blast and this one should be even bigger and better. Only 500 tickets are available and they’ll likely sell out fairly quickly, so don’t wait, get yours now. Here’s the link to buy tickets. See you there! If you dont drink wine would there be other drinks non alcoholic or alcoholic? Looking forward to this event. I’m sure there will be other options, but I’m not sure they are included in the price.